Violet Blakewood Lux came to LSU as a sophomore in 1942. When World War II called many Tiger Band members overseas, she quickly joined the first class of females to play in the band the next spring. That’s where she met her late husband. That’s where they began to establish their legacy. Violet and Turner Saunders Lux marched together in the band, which was then part of the ROTC program. In 1944, the war called them, too. Violet joined the Navy Women Accepted for Voluntary Emergency Service. She was stationed in New York City where she sang and entertained troops and new recruits. Turner was deployed in fall 1944 and by year’s end was part of the Allied forces pushing across France toward Germany. He lost a leg to a landmine in March 1945 shortly before his unit crossed the Rhine River into Germany. While recovering from his injury, the couple married in December 1945. Both Turner and Violet resumed their studies at LSU and completed their degrees. They moved back to Baton Rouge in 1948, where Violet still lives. Bond, one of their three children, decided to continue their legacy by joining Tiger Band in 1974. He still continues that legacy with an endowed oak celebrating Violet and Turner’s connection to LSU and Tiger Band. Bond and his wife, Nita, considered endowing an oak for 10 years before deciding to honor their parents through two endowed oaks. “We really thought it was a nice way to honor our parents and say ‘thank you,’ and also help out the university,” Nita said. The first of their gifts, the oak honoring Bond’s parents, is a sapling outside of the new Tiger Band Hall. Bond said he hopes the oak will inspire other band alumni to endow oaks around the building. 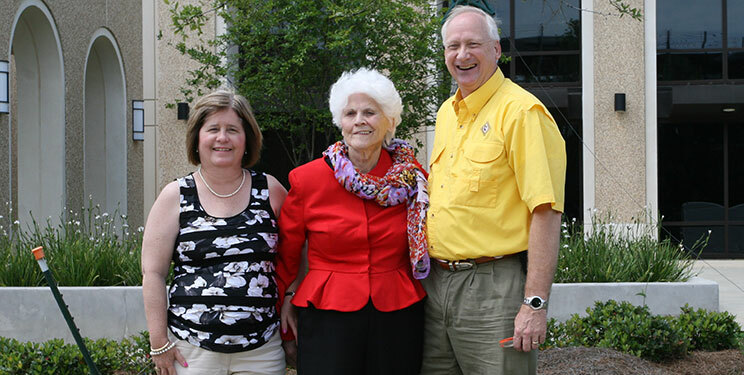 Bond and Nita will honor her parents through an endowed oak near the French House, paying tribute to her parents’ commitment to the French program.